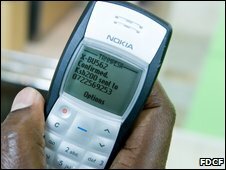 A device which blocks mobile phone signals has answered the prayers of some Kenyan Muslims. Imams in Kenya have long complained that mobile phones constantly rang during prayers, disrupting services. Imam Hassan Kithiye says he bought the machine in Dubai and it has been well received by his congregation. A BBC correspondent in north-eastern Kenya says other mosques around Garissa town are now trying to raise enough funds to buy their own device. One mosque has resorted to fining congregants $3 if their phones ring during a prayer service. But this failed to solve the problem, imam Sheik Abbi-Azziz Mohamed told the BBC. "We used to use that tyrant approach but it didn't work. Some people are so poor that they cannot even afford to buy airtime. We couldn't expect them to pay," he said.